A Shoreham councillor has improved an unloved piece of ‘no man’s land’ in Brunswick Road by fixing up a bench and putting in place a new bamboo plant. Catherine Arnold, who represents St Mary’s ward, wanted to make the small square to the left of the entrance to the sorting office ‘a nice place to sit and enjoy a chat’. The piece of land had been home to two ‘ramshackle’ benches, one of which had been vandalised with pink paint. When Mrs Arnold’s efforts to find out who was responsible for the land proved fruitless, she decided to take the future of the ‘no man’s land’ into her own hands. She got in contact with Mark Oakley of Any Gardens, who volunteered to fix one of benches by recycling parts from the other one. B&Q in Shoreham then donated a new bamboo plant for the corner, which Mrs Arnold potted used recycled tyres from Kwik Fit. 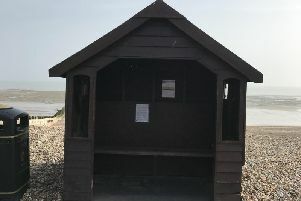 She said: “There are very few places in central Shoreham to sit down and relax. She is now looking for a business to sponsor a second bench for the site.